Please call 1-866-858-3276 or email us at info@mapleleafpromotions.com to Order or Inquire, or Order Online . Economy Personalized Pocket Planners Custom Printed in Bulk. Promotionasl, Monthly and Weekly. Lowest prices in the USA and Canada. Optional clear covers to allow paper or photo inserts. Refillable, with Vinyl Covers. 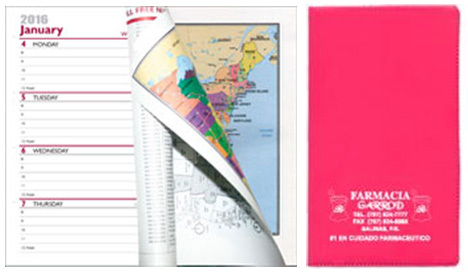 Good quality personalized planners of 2 types: monthly pocket planners and weekly pocket planners, printed in 2 colors and with many extra features, at unbeatable prices: Budget Prices for USA, Canada for personalized vinyl planners. Union Made in USA. Free artwork design. We will send you a proof for your approval before production. A Month at a Glance format features 32 pages and shows one month on a two page spread. The Planner inside is printed in two colors and runs 14 months, from December through January. Available in 18 brilliant standard colors. Imprint Color: Gold & Silver are the most popular colors. Please note that we are limited to the available industry foils and cannot match a PMS color via the hot stamping method. 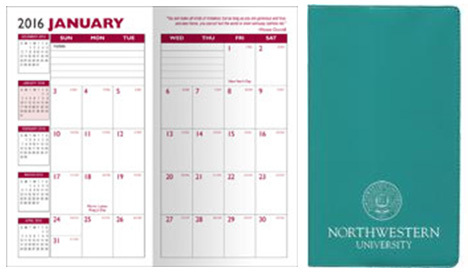 Description: This standard vinyl cover weekly planner features a week at a view format in a two-color print. It includes an 8 page full color USA Atlas with city maps in the back, as well as pages for important phone numbers and dates, popular 800#s and an expense record. Also included is an area for advance planning, metric conversion chart, time zone/area code map and an important holiday's page. Imprint Color: Gold and Silver are the most popular and recommended colors. Please note that we are limited to the available industry foils and cannot match a PMS color via the hot stamping method. Imprint Location:Standard is on lower front cover (other locations available upon request).